I think I’ve made it pretty clear in my last posts how much I love all things vintagey, old, worn, passed down, loved. Things with a history and a story mean so much. Brand new and perfect doesn’t interest me. Faded, dinged up a bit, missing a button or two, I adore it. There’s a mystery there, a romance, a cherished moment hiding, only to be imagined. That’s probably why I live where I do–an very old, very stubborn beachstone house that’s been home to countless families before us. It’s dark and moody, a Craftsman. I call it stubborn with affection. It hides a lot and doesn’t give up its secrets easily. And why should it? A family comes in, stays awhile, changes and rearranges walls, rooms, fixtures and then moves on one day without looking back. So it was with utter wonderment, glee, delight and extreme excitement that I recently found something very surprising in the garden, tucked away and hiding behind the very ancient camellia hedge. So we called for a bit of emergency help and slowly booted out the weedy offenders and spruced things up a tad. Which is why I was walking behind the camellia hedge. Because now I could, the path was cleared and I could poke around. It was then I noticed a clump or a bump or a mound dark and in the shadows,that just didn’t fit in with all the other green shapes. I saw a glint of blue and a claw and my heart stopped. What better thing to find in your garden than an old and neglected and beautiful blue clawfoot tub turned upside down with its little legs waving around in the air signaling for help? Of course it will have a brand new life with us, just the way it is. It will be moved into the little garden behind the house that we like to call our “French Potager,” even though we were very unsuccessful growing any of the lettuce and radishes and peppers and carrots that we planted. One bean vine made it. But the garden is starting to look quite pretty with a few blue hydrangeas and ruffly pink petunias. 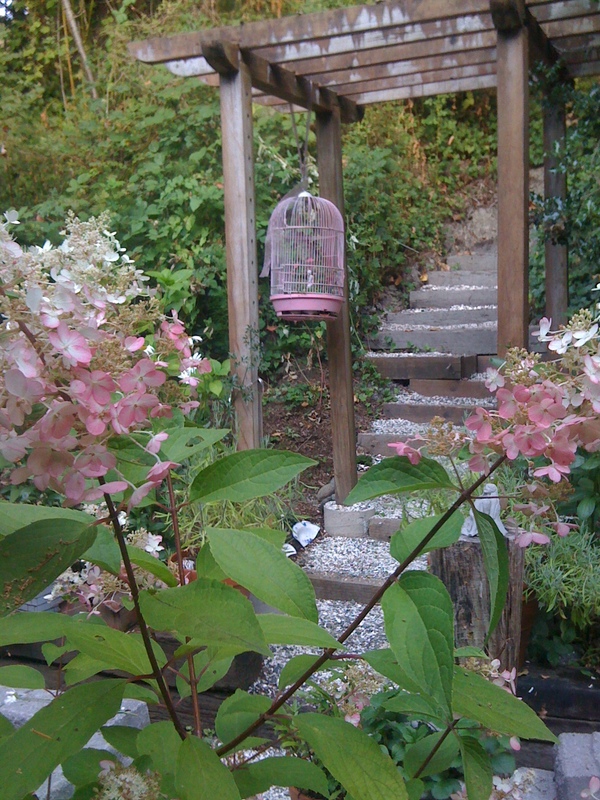 A vintage pink birdcage hangs from a salvalged trellis. And the blue tub will soon join it and will be filed to the brim, not with bubble bath but with pink strawberry plants. And that is a very roundabout way to let you know that I have a new show of my paintings, opening September 4. They have lots of pink like my birdcage. They have lots of blue like the chipped and lovely old tub. And lots of red and orange and turquoise. And they’re worn and faded, with lots and lots of layers of paint and color over color, giving a nod to the past. 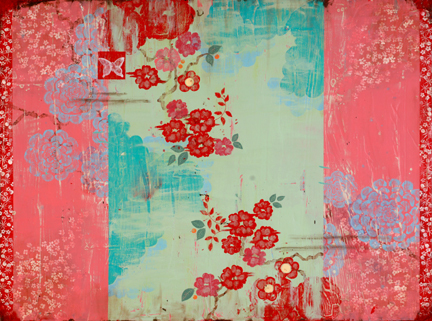 I call the collection “The French Wallpaper Series,” 17 paintings in all, inspired by hand-painted, time-worn walls of grand old mansions, done in a Chinoiserie style. There are birds and berries, leaves and vines with a touch of mystery and fantasy, each telling its own story in its own aged and ancient way. I hope you enjoy my work. Opening reception: Saturday, September 4, 5-7 p.m.
I’ve recently had the pleasure of getting to know a fabulous designer Michelle Salz-Smith from Studio Surface. We met through a group of interior designers and decorators that I was introduced to through the magic of Twitter. It’s been so enjoyable to exchange information about color, design, art and projects on a daily basis with this group and the 140 character “messages”. But to really get to a better and deeper idea of what’s going on, it’s always great to visit the blog-more room to explain, more images to show. Some time ago, Michelle was kind enough to interview me for her blog. You can read it here. I’m very opinionated when it comes to color. When I paint, I’m directed by instinct–does Red work well in this corner? Does Pink belong next to Turquoise over here? My color choices are all based on what I see on the canvas as I work–it’s not something I consciously think about. I feel the colors and listen to their stories. Sometimes Red can be bold and bossy, but darken it with a Amber glaze, it stops shouting and gets all moody and mysterious. Pink is the same way–Sunny and Silly and Sweet, but then here comes Jade Green to the party and the tone changes. Sunny goes Sophisticated. It’s one of my favorite things about working with color. I love to see the interaction, the nestling in and combining and pairing up and then the final expression together of something stronger and more important than each color could say by themselves. As much as I like all colors, I admit that I play favorites. My basic palette starts with Blue, Yellow, Lt. Green and Pink. From there I know I can go big with Red, or more sultry with Wine. But recently, working on a new body of work for my upcoming show opening Sept. 4th at Museo Gallery, I wanted to try some new colors that I had not invited into the studio before: Orange and Periwinkle Blue. I knew I would need a lot of room to work with this new relationship. I chose one of my favorite canvas sizes: 36×48. And away we went! I hope you enjoy the “new romance”–I think Orange and Periwinkle Blue might be together for a very long time! The good news I’d like to share is that my painting “Sakura Kisses” has been purchased by a major Seattle hospital for its public art collection. It’s one of my big pieces, 36×48, a size I really love working with. It allows me a lot more room to tell my story–joy and abundance, happy quiet moments, love, togetherness. I combine pattern and my favorite colors to express this message: reds, blues, pinks and sometimes the unexpected orange. And my images–plump lovebrids nestling, berries, vines, flowers in bloom–are meant to reflect a moment in time when all everything is just as it should be: peaceful and pretty, loving and serene. These are the things I think about as I work. As I paint, layer upon layer, I do hope all those things that I’ve just described resonate. So it was with complete happiness that I found out “Sakura Kisses” will be installed in a place where people will really be looking for something to soothe a perhaps anxious and difficult time in their lives. Its an honor to think that one of my painting might help to lighten someone’s burden of worry. Living on an island, surrounded by sea and salt and rocky beaches hiding all sorts and shapes of old and tumbled bits of sea china, has made its mark on my paintings. I paint stories of romance and abundance and joy–you can see it in the way I love to nestle my birds together on a leafy limb, the way my vines are filled with plenty of red ripe cherries–and I paint with an eye to the past, an eye to age-old imagery and design. So when I head out early each morning to walk the usually grey and misty beaches near home, I keep my head down, intent on finding that one thing that never ceases to thrill and inspire: beach china. The designs on these small pieces of Asian blue and white porcelain, no matter how faded and worn (the more the better), are so beautiful and so compelling, it makes me want to run all the way home and pick up my brush! I live by the sea. Each day, rain or shine, I walk on the rock-strewn shore. I love the blue of the water and sky, but I’m on a mission: I’m after treasure. 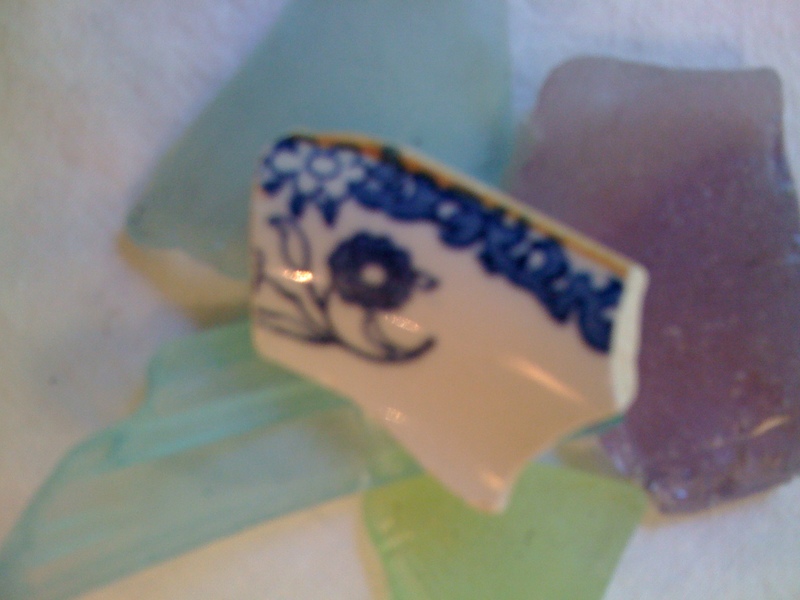 Sea-scrubbed softened shards of beach glass in lavender, azure, light green are magical. But I leave them. 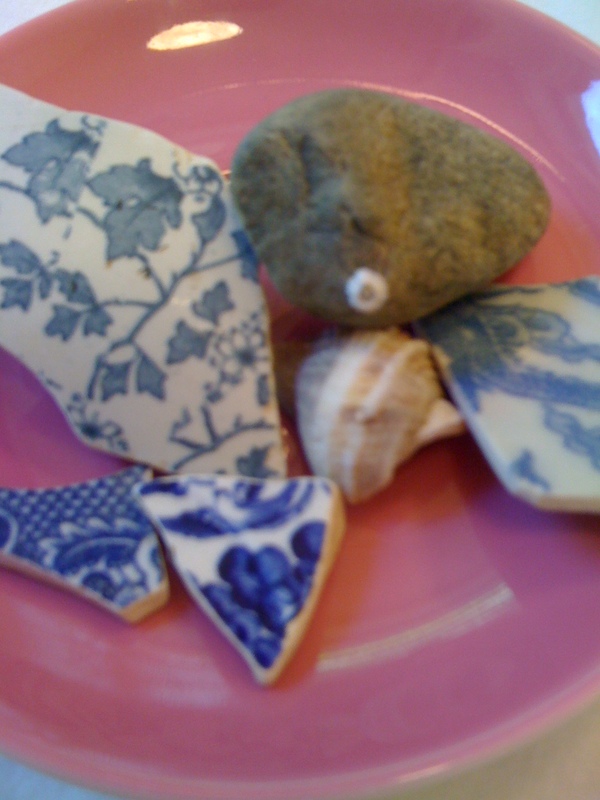 It’s the age-old, darkened bits of blue and white Asian porcelain that tell the best stories. A dragon roars, a peony blooms–cast to the sea, back with the waves, now in my hand. I carry the china home. 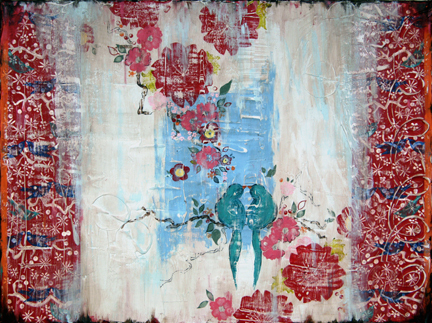 I paint it into my canvases, inspired by pattern, beauty, home. And here is a detail from the painting it inspired. 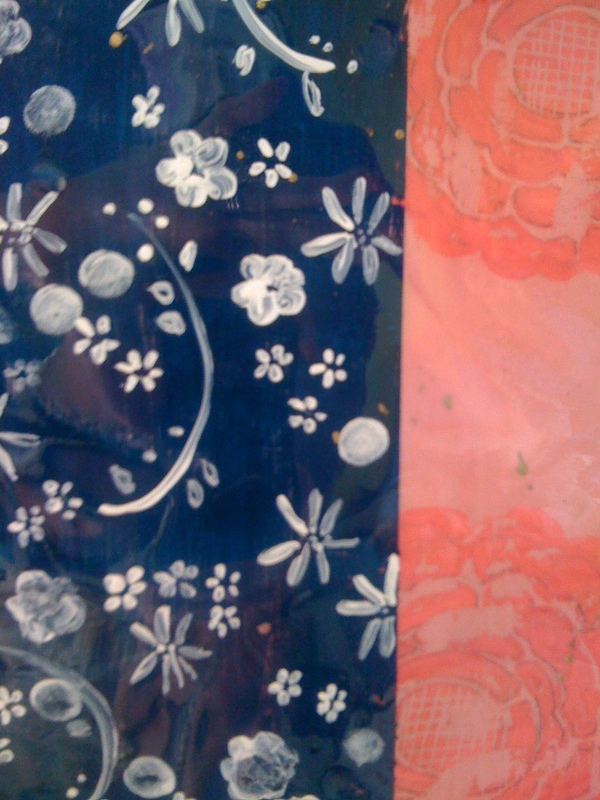 Dark blue and pink, aged with the past, I’m so happy it will be hanging in her room, a happy memory for both of us. New blog, new magazine feature! For now, the big news is about my paintings. 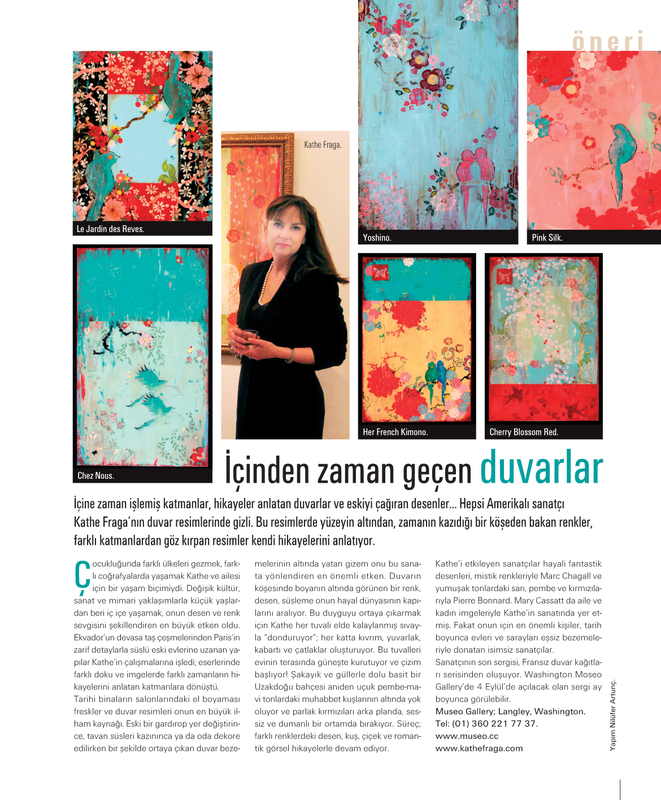 I’m honored to have my work featured in the magazine Maison Francaise, Turkish edition. It’s a heads up about my art and my process, what and who inspires me, and shows examples of my work. As you can see, I love color and pattern and the faded look and romance of vintage imagery. I’m delighted that the magazine has provided a link to my website and also to my gallery Museo in Langley (Whidbey Island) Washington-my show opens there September 4. Perhaps I’ll see you? You can’t miss me–I’ll be the one with the unintentional specks of paint in my hair!